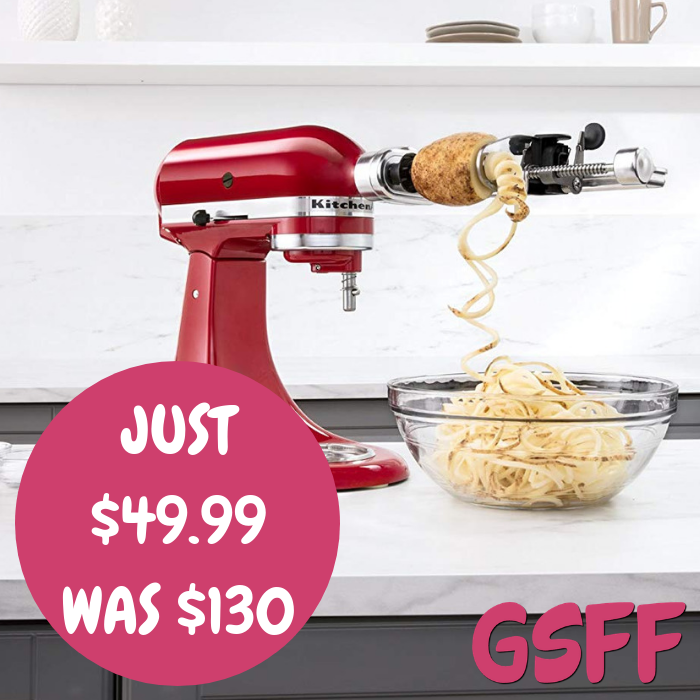 KitchenAid Spiralizer Attachment Just $49.99! Down From $130! Shipped! You are here: Home / Great Deals / Amazon Deals / KitchenAid Spiralizer Attachment Just $49.99! Down From $130! Shipped! Amazon has this KitchenAid Spiralizer Attachment on sale for just $49.99 down from $129.99 PLUS FREE shipping! Reinvent classic meals and inspire your culinary creativity with fresh fruits and vegetables. The versatile KitchenAid Spiralizer with Peel, Core and Slice Stand Mixer Attachment with 5 blades is perfect for fresh fruit and vegetable recipes, from zucchini noodles to sweet and savory dishes. The KitchenAid Spiralizer uses 4 quick-change blades and an optional peeling blade to inspire healthy versions of classic recipes and unleash your culinary potential.